Deep State Determined to Take Out Trump, Only The American People Can Stop It. 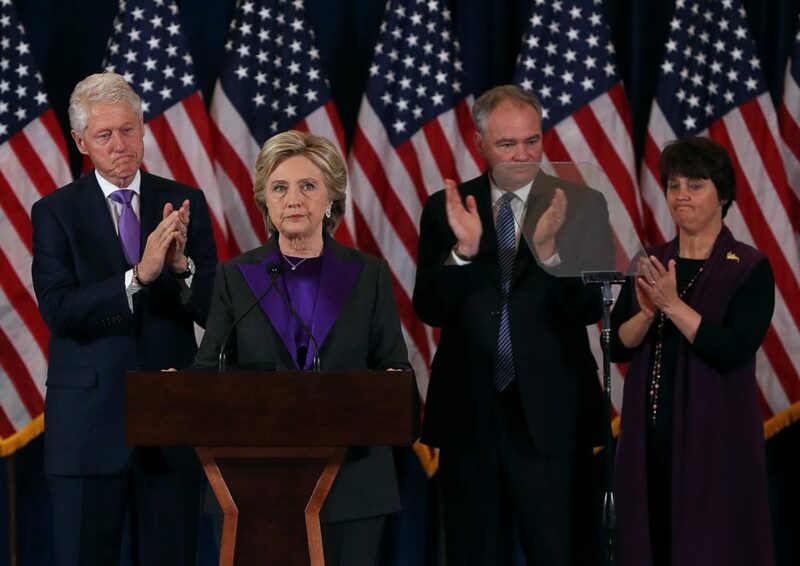 Even Tim Kaine’s wife (far right) was dressed in purple during Clinton’s inflammatory concession speech that was actually a veiled call to insurrection. Everything in Washington, D.C. now points to a rapidly evolving soft coup. A well-known pastor, who recently met with the POTUS in the Oval Office, has even been told of a coordinated plot to “take out” Trump by a senior Republican. Clearly, the same seditious perps will not hesitate to conduct a violent coup d’état to overthrow the president, should that be the only way to remove him from power. The critical issue here is what Trump MUST do for the good of the Republic. He cannot allow these CIA-directed Bolsheviks to pull off another “Kiev coup”. Perhaps this criminal conspiracy will develop more like the failed Ankara coup whereby President Recep Erdoğan used the insurrection as a means to identify all the perpetrators throughout Turkey. Trump himself has referred to the possibility of a coup here similar to that recent decisive episode in Turkish coup history. Under no circumstances will Deep State permit Trump to continue as POTUS beyond a certain date. The U.S. Intelligence Community and un-named Secret Services have a well-planned schedule of events ready to orchestrate to take him out one way or another. There’s not a week that goes by when former intelligence agency heads do not appear on major MSM platforms to subtly promote and coordinate their soft coup. KEY POINT: President Trump has already proven to everyone concerned that he will not play by the rules of Deep State. He has demonstrated repeatedly — like no other national leader in modern history — that he will not hesitate to break those rules whenever he so chooses. However, the strict adherence to the rules are crucial to the running of the Global Control Matrix, as they are to the management of the Anglo-American Axis and administration of U.S. Federal Government. For these, and many other significant reasons, the World Shadow Government is quite determined to terminate the Trump presidency. That is, of course, if the American people permit this ongoing coup to proceed unimpeded. Never in American history has the establishment been so transparent about their subversive intentions to carry out a coup in broad daylight. It appears that Deep State is so confident about their eventual success that they even telegraph many of their schemes well in advance of their execution. While some of these stratagems may be red herrings, many are not. The most threatening of these schemes was the appointment of Special Counsel Robert Mueller. That highly contrived maneuver was set into motion to put Trump’s presidency under a dark ominous cloud before the agents of Deep State methodically unleash a D.C. superstorm centered on the White House. The actual plot to topple Trump involves every major political institution in the USA. That especially includes the Democratic Party and DNC, Republican Party and RNC, numerous think tanks and brain trusts inside the Beltway, as well as countless Deep State operatives strategically positioned throughout the US government. You name them; they’re in on it. These primo agents of Deep State are greatly assisted in this coup by many Obama-era appointees, Clinton loyalists, Soros-funded PACs, Congressional RINOs, MIC lobbyists, and political operatives of every stripe who owe their allegiance to the shadow government. * Then there are those hidden government employees and well-placed politicos who have been compromised and/or coerced by the Pizzagate control mechanism. Because the Global Control Matrix is maintained by the criminal control mechanism now known as Pedogate, just about any power broker can be drafted as a purple revolutionary. Pizzagate represents but a single American franchise within the global Pedogate child trafficking and exploitation crime syndicate. While the true depth and breadth of this treasonous cabal is unknowable, it wields considerable power and influence over every state apparatus. Deep State will ultimately attempt to enlist the help of every American who dislikes Trump. By constantly inflaming the public’s sentiments against the administration, the agitators are confident that a large number of U.S. citizens will support a coup, both soft and violent. The real problem is that the true political calculus confirms this critical data point. This state of affairs is exactly why AG Jeff Sessions must be replaced asap. Heretofore, he has neglected to go after the worst criminals from the Obama Administration. These are the same agents provocateur who are openly and furtively leading the Purple Revolution. Until these traitors are investigated and tried, they will continue to act with impunity. More significantly, they will feel empowered to take Trump down as well as his entire administration. Each of the co-conspirators mentioned below is integral to the implementation of George Soros’s quickly unfolding Purple Revolution. The upshot of this discussion is that there is no stopping the Trump Titanic from hitting the Deep State iceberg. With each passing day the final collision looms larger and larger. The level of outright madness that has come to define the mainstream media circus, the chronic felony leaking by Obama loyalists, and the serial lawbreaking by the U.S. Intelligence Community can go on for only so long. In fact, this ever-intensifying predicament is not far from hitting the proverbial wall. The NWO globalists now work overtime to scuttle Trump’s “Titanic” before it hits the Deep State iceberg. The globalists know that, with Trump at the helm of the ship of state, the USS Titanic luxury ocean liner might just be an icebreaker in disguise. And everyone knows that the Russians make the world’s best icebreakers! Whether Trump is on his own Titanic or really at the helm of an enormous icebreaker remains to be seen. Regardless, the covert leaders of Deep State will not tolerate much more wrecking of their multi-decade party. Trump has quite remarkably taken a massive wrecking ball to every part of their overt and covert operations. Not only can he never be trusted by TPTB, Deep State always gets even one way or another. Trump’s personal plight is such that he cannot lose this war since such a fall from power will translate to the slo-mo devastation of his estate, his businesses, his family and his future. Likewise, Deep State knows that it cannot lose the upcoming final battle against Team Trump. Most importantly, the USA is the Military Arm of their New World Order. Were the US Constitution to be fully restored and “rule of law” re-established throughout the land, Deep State would be forced to relinquish its complete command and control over the military juggernaut that roles across the planet. There are some major indicators that point to August through October of 2017 as a time of epochal conflict in the USA. As a matter of fact, the treasonous Congress has taken legislative action that is purposeful in setting up Trump for impeachment. The same group of traitors has been writing legislation to compel Trump to go after Russia, thereby undermining his peace initiatives and overtures made to President Putin. Catastrophic Move By Congress—It’s time to drain the congressional swamp! The bottom line is that these heightening tensions can only go on for so long. Too much is breaking out into the open and Deep State will not stand for much more. Each day brings unprecedented revelations about how the world really works. The Global Control Matrix is literally cracking up. The “enforcement by terrorism” paradigm is also dissolving in real time. The normally effective fear factor is slowly losing its grip. For Donald Trump has presented to the world community of nations — wittingly or unwittingly — himself as an unparalleled role model of how to speak truth to power. Not only does Deep State want Trump out of the White House, they want war with Russia in the worst way. Had Hillary Clinton won the election, there might already be a nuclear war with tactical nukes…in Syria, in the Ukraine, in Iran, or wherever the next color revolution is planned for. Clearly, the perpetual war economy is in full swing and only a Trump-Putin accord can stop it, once and for all. Which is precisely why the NWO globalists do everything possible to sabotage their relationship. 2017 will undoubtedly go down in history as the year that the world really changed. That profound and fundamental transformation will likely precipitate from the epic battle now raging between the American patriot movement and globalist Deep State. Just as 2016 marked the beginning of the Second American Revolution, Donald Trump is the commanding general of the nationalists. Just like General George Washington, he finds himself retreating again and again, but with great effect and awesome consequence to the New World Order agenda. President Trump has entered uncharted territory. Similarly, Deep State is way out of its depth having never been challenged in the USA by a justifiably angry patriot movement. However, it’s not incumbent on Donald Trump to take back the country from those who have stolen it. His AG can prosecute those public servants who are guilty of every sort of theft and larceny. But, it is the solemn responsibility of the American people to take back their nation from the globalist usurpers. And, to finish the job of wrecking the Deep State that Candidate Trump so earnestly started in June of 2015. *The United States of America was, in fact, stealthily taken over by the British Empire the very day the Brits lost the American Revolutionary War. Since there were also many clandestine and traitorous loyalists living in the Thirteen Colonies back then, they have had well over 200 years to systematically hardwire the United States as the flagship of Deep State. The same perfidious forces have co-opted and compromised many government officials and political leaders, military commanders and corporate execs, university presidents and think tank directors, civic leaders and heads of state & local governments throughout America in 2017. In this way, the whole place has been surreptitiously set up for the Purple Revolution. When will Team Trump terminate the ongoing coup d’état? Foolishness, selfishness, corruption and betrayal of our nation by it’s political elites have served to reveal dangers within our republic. Exhausted, we accepted that 2016 was the time when forceful correction needed to be applied. However, misplaced corrective action, regardless of intent, would be neither safe nor wise. The media are disconnected from the reality of their landscape yet seem to find themselves opining about political violence. Those media voices would be wise to remind themselves that candidate Donald Trump, now President Trump, was the “lesser extreme” strategy for correction. As President Trump said during a recent rally in Iowa: “they’re lucky our side isn’t violent.” He was entirely accurate. President Trump is the last best option. We’ve watched the shooting of cops, and the protests parades which followed, absorbing. Everyone should be thankful for the opportunity President Trump is providing. joins the GoldFish Report Team, Louisa, Steve and Kent, to discuss moving towards a Two Tiered Money System and Money created for the Private Side. Winston explains the backing of currencies and the revaluation of currencies, the New Republic of the United States, NESARA, GESARA, Basal III Compliance, St. Germain Trust, Heritage Funds and the ‘Plan of The Experts’, soul development and much more. This interview is jam packed with Winston’s incredible knowledge, wisdom and southern good heart. For more information about Winston’s Solutions in Commerce, Please visit http://www.wssic.com. Also, the link to the article he references in this interview is located below. To help support this viewer supported public social research media please visit http://www.thegoldfishreport.com. To follow us on Twitter go to @ReportGoldFish, you can also like us on facebook at http://www.facebook.com.thegoldfishreport and on our blog at http://www.thegoldfishreport.wordpress.com. Thank you for viewing!